In any era, great Americans inspire us to reach our full potential. They know with conviction what they believe within themselves. They understand that all actions have consequences. And they find commonsense solutions to the nation’s problems. ?One such American, Thomas Paine, was an ordinary man who changed the course of history by penning Common Sense, the concise 1776 masterpiece in which, through extraordinarily straightforward and indisputable arguments, he encouraged his fellow citizens to take control of America’s future—and, ultimately, her freedom.Nearly two and a half centuries later, those very freedoms once again hang in the balance. 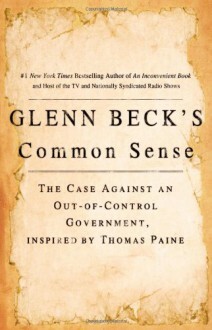 And now, Glenn Beck revisits Paine’s powerful treatise with one purpose: to galvanize Americans to see past government’s easy solutions, two-party monopoly, and illogical methods and take back our great country. As if this guy ever read Paine. What a joke.